The first of our Autumn Used Boat Shows is nearly here! If you’re looking to buy or sell a boat on the East coast, our Used Boat Show events are the biggest, longest running and most important shows this Autumn. 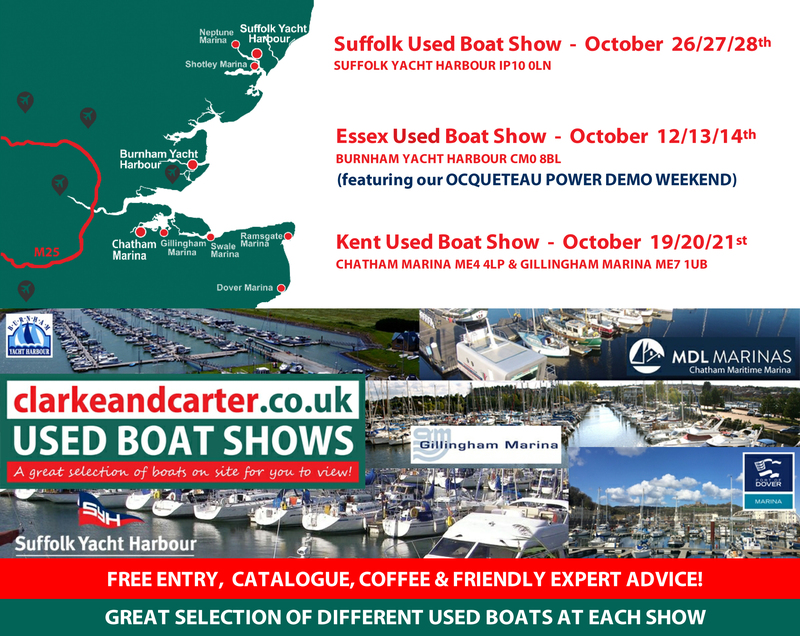 Our Essex Used Boat Show is the first of the season, held at Burnham Yacht Harbour on the 12th, 13th and 14th October. This year we are also holding an Ocqueteau new boat demo weekend with four exciting models on display. On Saturday and Sunday there will be demo trips available in a Timonier 725 (outboard powered) and Timonier 625 (inboard diesel). Spaces are limited and demand may be high so please contact us in advance to book your place and avoid disappointment! Dolphin Sails will be on hand at our Essex Used Boat Show to offer expert advice on sails, sprayhoods, cockpit enclosures, biminis, and even their amazing tension awnings for your garden or business property! Marinestore chandlery will also be offering some very special deals on kit including clearance lines. These will only be available in store at their Burnham outlet this weekend so come along and see what bargains you can find. FOR MORE LOCAL BOATING NEWS, EVENTS, COMPETITIONS AND OFFERS SIGN UP TO our newsletters OR FOLLOW OUR facebook page!